At GN Designer Jewellers in Melbourne, we have plenty of options for men to express their individuality or convey their love with an array of men’s wedding rings. We can handcraft men’s designer rings that are elegant and sophisticated while still expressing your style. Whether a wedding, engagement or dress ring, we can form the perfect men’s designer rings for you. As well as style, we will also take into account your lifestyle – if you work with your hands, you may need something with the functionality that allows this. Alternatively, if you’re looking for something more flashy, we are sure to stock that too, and we’ll find the right ring for you. You can choose a ring setting, select your metal and add diamonds or stones of any colour or size. We have plenty of sophisticated and stylish options for men. We can craft something bold and unique, or forge modest and simple men’s wedding rings. GN Designer Jewellers in Melbourne has a collection of men’s wedding rings in strong and masculine styles using yellow gold, white gold, sterling silver and tungsten, as well as an extensive range of diamond rings for something more flashy. Perfect for men’s wedding rings, or just for a fashion statement, our men’s designer rings come in both modern and trendy or classic, traditional designs. If you are shopping for gents engagement rings, we will have something to suit both your style and your budget. More than just a decorative piece, the wedding ring imparts a message and conveys the wearer’s lifelong commitments. With a long symbolic history, the tradition of wedding rings is rich with significance. From their conception, wedding rings have symbolised love and commitment and agreements between families, and they remain a symbol of undying devotion and dedication. Their simple shape, the circle, with no beginning or end, is the symbol of eternity, beginning as far back as ancient Egyptian culture. It is not only the shape of the metal that is significant, but the negative space is considered a gateway to the future, the unknown. There is a multitude of design options available to showcase personal style and significance to allow your gents engagement ring to be worn with pride for a lifetime. It is a more recent tradition that men have also adorned wedding rings. It is thought to have become very common during World War I, when men’s wedding rings were worn as a symbol of remembrance while the soldier was away. Now, however, men’s wedding rings or a gent’s engagement ring is seen as a symbol of a union rather than a form of remembrance. This shift can be attributed to change in thought patterns. Now the couple belongs to one another, and the ceremony of delivering each other with rings is the symbol of their commitment to one another and offered with love. While it is notable that men’s wedding rings are often less flashy than women’s rings, the options are endless, and if you can’t find something that speaks to you in our collection, you can design your own. Whether practical or statement-making, GN Designer Jewellers in Melbourne can find the perfect ring for you. Whether plain metal bands or adorned with jewels, diamonds remain the popular choice for wedding bands. This is not merely tradition or fashion driving this trend, but a diamond’s durability, strength and beauty, which are readily associated with eternal love. Diamonds are the perfect symbol of a treasured, long-lasting bond. 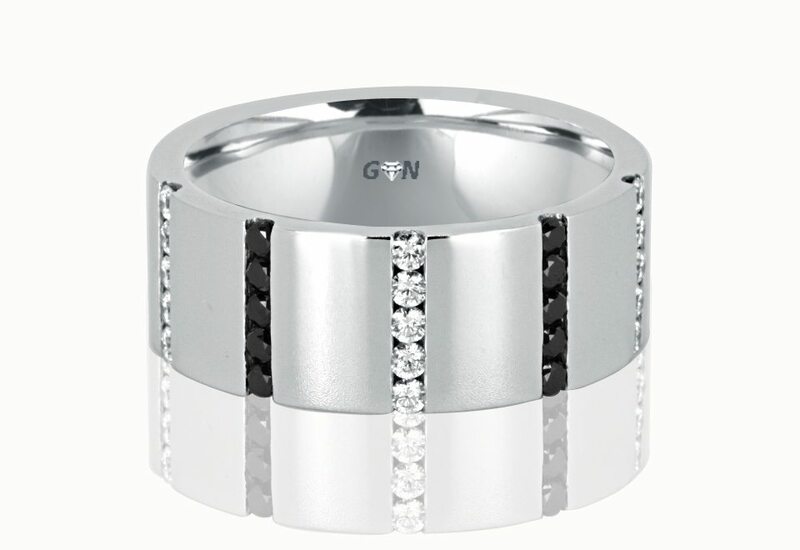 For more information about men’s wedding rings or men’s designer rings in Melbourne, contact GN designer Jewellers.